The Church truly loves you all. Our great Predecessor Pius XII affirmed this with all strength, and repeatedly, in the course of the last world conflict, and all know what he accomplished in defense and for the rescue of all those who faced difficulties, with no distinction whatsoever. And nonetheless, you are aware, suspicions, and even accusations, have been hurled against the memory of this great Pontiff. We are glad of having the opportunity of affirming it on this day and in this place: nothing is more unjust that this outrage against such a venerable figure. Those who, like Us, knew this admirable soul closely know just how far his sensibility could go, his compassion for human sufferings, his courage, the sensitivity of his heart. Those who, just after the war, came, with tears in their eyes, to thank him for having saved their lives also knew it. In truth, following the One whom he represents down here, the Pope wishes nothing else than the true welfare of all men. Amen! The third in the great line of popes named Pius of the twentieth century. I thank God that my early childhood was blessed by the pontificate of this most wonderful Holy Father. We inherited the Sacred Traditions of The Roman Catholic Church just before the liberalising modernists deconstructed The Faith leaving us with nothing recognisably Catholic but replacing our heritage with pastoral anarchy, doctrinal confusion and liturgical protestantism. Among others, his prophetic utterance concerning the loss of the red sanctuary lamp now reality is as profound as his capacity for dealing with the Nazi & Communist menaces. I have a question. 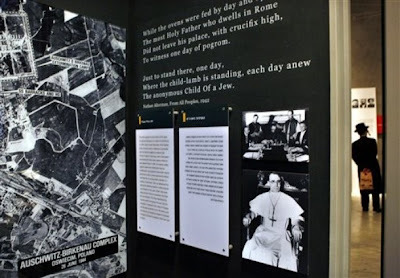 Is the Holy Father planning on visiting this museum which still has the label which attacks Pius XII? I heard before the trip that he was planning on refusing to attend unless they removed the label. What was the result of that conflict? The Pope *claims* that he has come to the Middle East on a "mission of peace" but, after his 2006 speech in Regensburg, many Muslims here in Jordan are sceptical about his sincerity. On that occasion, he called the Prophet Muhammad "evil and inhumane" [these are the exact words in this case]. Soon, this Pope will travel to Israel. But many Jews there are outraged because he will not desist in trying to canonise "the Pope of the Holocaust" and because he has recently removed the excommunication from a "Holocaust-denying Bishop" [exact quote]. The way they put it, it sounded as if this Bishop was excommunicated in the first place for denying the Holocaust and that Benedict XVI was so outraged by this that he withdrew the penalty. I was flabbergasted by this out-and-out character assassination of our Pope. I figured that they could not possibily top this. But tonight, on the 11.00 p.m. radio news, they did! Before repeating all the foregoing lies and distortions, they called our Pope the "Hitler Youth Pope" and 'wondered' how such a Pope would be received in Israel. After my jaw rebounded from the floor, the reporter went on to "admit" (his verb) that Benedict XVI was forced into the Hitler Youth. What the hell. Might as well include this minor distinction. Anyway, their attempt was to associate the Vicar of Christ with Adolf Hitler. It seems to be justified. After all, both were from German-speaking countries, so they are practically indistinguishable. I am 'wondering' (to borrow one of their favourite verbs) what would happen to any C.B.C. reporter who might treat the Dalai Lama like this. Ditto for Barak Obama, Nelson Mandella, or one of the Chief Rabbis in the Levant. But to ask such a question is to answer it. The C.B.C. is the Government media in Canada. All taxpayers are forced to support it. To create a parallel, it's like a government which hires arsonists to burn down Catholic churches and then forces Catholics to foot part of the bill to apy the arsonists. I realise that the C.B.C. is an organ of the Antichrist. However, I have never before seen them go this far. They must hate the Holy Father with a demonic fury. Their coverage was sick; it was like a mania. It was no mere hatchet job but out-and-out slander. 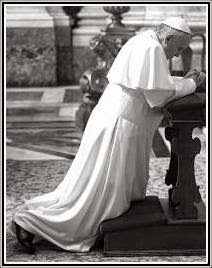 I close is urging everyone to pray for a safe return for the Pope at the end of this coming week. To be very honest about this, I am starting to get really worried about his safety. May our Lady and his guardian angel protect him. P.S. Of course, the idiots called the Pope Benedict XVI 'Pope Benedict', which he isn't except in formal prayer, but this is a very minor insult given what else they said. For once, I hardly noticed it. The media, in this case the CBC but also the US network flunkies, claim to be on the side of Justice and civil rights but they continue their hateful rhetoric against the Pope who is, ostensibly, trying to promote proper concern for the natural law. They also hurl invectives against Pius XII who did more for holocaust victims than any of the other so-called religious leaders of the times. It boggles the mind. At some point a Pope must tell both Jews and Muslims that there is only one way to the Father and that is through Jesus the Christ. I don't know if all of the readers here are already familiar with Rabbi David Dalin's book "The Myth of Hitler's Pope" but I found it to be pretty good. It emphasizes that the attacks on Pius XII originated with liberal dissidents from the Church who are crassly using the Holocaust for their own ends, and that in fact Pius XII saved thousands of Jews by his personal interventions and was recognized for this at the time (before the smear campaign had been fabricated). One woman who heads a council of Jews in Palestine, has asked that Benedict XVI clarify 'once and for all' that Jews don't need Jesus Christ and can be saved by waiting for a new Messias. She must be confusing the Pope with Cardinal Kasper. I'll try to dig up her name. It shows what never some of these people have. Dr. Deborah Weissman, co-chairwoman of the Interreligious Co-ordination Council, said she hoped the Benedict's “ambivalence” on theological issues affecting Jews would be clarified. The pope still had not made it absolutely clear that Jews did not need to embrace the belief that Jesus was the messiah to be redeemed, she said. It's a point of view! Let us also not forget that Rolf Hochhuth (author of "The Deputy") turns out to have been a Communist apparatchik, and his play a calculated component of attempts to discredit the imposing memory of Pius XII. The plot originated from the pit of pits...the Kremlin itself. Somebody writes that he's just developed a soft spot in his heart for Paul VI, no doubt for that Pope's comments on Pius XII. Well, I haven't. On the contrary, it makes me question the value of Pius XII's papacy. That's how bad Paul VI was: anything he approves of is at least of dubious value. Come to think of it, Bugnini was unleasehed by Pius XII in 1948 and began his damaging work then. The reforms of the 1950s were, of course, merely preparations for what was to come. On the other hand, Pius XII was ill those last many years and probably had no idea what was being hatched. Anyway, I find it hard to imagine a Pius XII signing into law "Missale Romanum". In regard to Pius XII, I think that it's time to turn the spotlight on the media. What did our media do in the 1940s to make the world aware of the Holocaust? Answer: almost nothing. In fact, the reporters didn't know about it, which stands to reason, since they don't know squat about anything. In the Second Vatican Council and the Nostra Aetate document, it was made clear that no efforts would be made by the Catholic Church to convert Jews. Rather, the Jewish people should continue the faith of its [sic] forefathers as expressed in the Bible and rabbinic literature. The Jewish people remain a people of God’s covenant, a people chosen by God to give the world the Bible [thanks but I got my copy from the Catholic book shop]. Put simply, the Catholic Church accepted the theological principle that Jews need not change their religion to merit redemption [a distortion: they may be saved despite their errors, yes, but they do not 'merit redemption' because of them]. I hope you will take the opportunity during your visit in Israel to reiterate this fact … I do hope now to get your help as a religious leader-- as well as the help of the entire free world-- to protect, defend and save Israel, the one and only sovereign state of the "People of the Book" from the hands of its enemies. The text of Nostra Aetate (the Second Vatican Council’s Declaration on the Relation of the Church to Non-Christian Religions) does not appear to address the issue of Jewish conversion. . . . Here follows a Catholic commentators analysis, showing that, in fact. N.A. does not say what this Chief Rabbi claims. Same old, same old. Before long, they will want Catholics to 'admit' that their faith is false and beg the rabbis to allow them to convert to Judaism. Of course, the Muslims won't be following suit! Just a reminder: we use the term 'Jews' to be polite. It is Catholic doctrine that *we* are the true Jews, the inheritors or the one promise. Our faith did not begin in A.D. 1. It opens with Genesis. There is only one Messias. Those who wait for another wait in vain. One last point, gents: if the Jews really don't believe that our faith is true, and if they are not called to convert outsiders, why on earth should they care what we think about the need for their conversion? The media creates its own reality - one is either taken in by it or one separates oneself from the message and searches elsewhere. The latter recourse is the wiser of the two. Even Rupert Murdoch publicly claimed to lie overtly and then to sit back and observe the outcome. Unfortunately, some of the supposed Catholic newsmedia has adopted similar strategies. 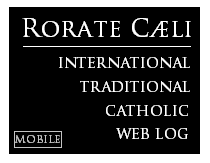 This is another reason why we need such spaces as New Catholic has crafted with Rorate Caeli. You can please some of the people some of the time but you can not please all of the people all of the time.